Nothing ruins a holiday quite like nagging worries about your home’s security. Frequent travellers will be all too familiar with this unpleasant sensation. Unfortunately, their fears are not unfounded. A comprehensive analysis of crime statistics between 2011 and 2016 by the NSW Bureau of Crime Statistics and Research identified a significant spike in break-ins and home burglaries on Christmas Eve and New Year’s Eve – times of the year when many people are away on holiday. On average, 763 property offences occurred on Christmas Eve, up from the daily average of 629. New Year’s Eve was even worse, with an average of 791 incidents. As a result, 84% of Australians said they worry about the safety of their home while they are away, according to a recent survey published by the Sydney Morning Herald (SMH) . The good news is that there are many steps you can take to secure your property while you’re travelling. Below, we’ve outlined some simple home safety solutions to help give you peace of mind during your next holiday. Don’t leave your lights on: At least, don’t leave them on 24/7. This is a common tactic to fool would-be burglars into thinking that someone’s home. But, in addition to decimating your next electricity bill, having your lights on 24/7 can look just as suspicious as not having your lights on at all. Instead, consider using a light switch timer, which can automatically turn your lights on and off on a pre-programmed schedule. Don’t close your curtains: Again, it can be tempting to close all of your curtains to make sure no one can see into your house, but this could also prevent well-meaning friends, neighbours, or law-enforcement officials from noticing if anything is amiss. Leave your curtains in the same position you usually would, so potential burglars don’t notice they’ve changed. Stop your mail: A letterbox overflowing with mail is a sure-fire sign that no one is home. You’ll be able to pick your mail up when you arrive home. Bring your bins in: As with the mail, leaving your bins out on the street for an extended period of time is a clear sign that no one is home. Mow the lawn before you leave: An unkept garden and an overgrown lawn are also clear indicators that you’re not home. If you’re going to be away for a long time, consider asking someone to mow the lawn while you’re gone. In addition to the above, social media posts pose a growing security threat to travellers. Recent SMH published survey results have found that 50% of people post holiday photos on their social media feeds, with 34% tagging their exact location. Despite this, people also said that, on average, they had not met one in three people on their friends list in real life . Therefore, they didn’t really know who they were sharing these important details with. While it can be incredibly tempting to show off those stunning holiday snaps and rack up the likes, they could also be putting a big target on your house saying ‘no one’s home.’ Next time, you might want to consider waiting until you get home to share your holiday photos, or at least reviewing your privacy settings before sharing your location. If you’re not satisfied that these options will keep your home sufficiently safe, then you have plenty of other choices to secure your home while on holiday. For many people, asking a trustworthy friend or neighbour to watch their house while they’re away is the go-to option. The main benefit of this is that it’s usually the most cost effective option – particularly if your friend owes you a favour or you can figure out a ‘mates rates’ deal. Also, having someone that you know and trust looking after your house can provide additional peace of mind, as opposed to paying a stranger to do it. Unfortunately, according to SMH published survey results, 82% of Australians said they would be more comfortable going on holiday if they knew their neighbours better. Accordingly, this isn’t a viable option for many of us.1 Further, no matter how much you trust your friend or neighbour, or how many times you ask them to do a particular task, if they don’t have previous house sitting experience it’s possible that they’ll accidentally overlook something important. Another popular option is to hire a house sitting service while you’re away. House sitting companies offer a variety of services, with many allowing you to browse through available house sitters and read their reviews online to determine your preferred option. One advantage of hiring a house sitter, rather than a friend or neighbour, is knowing that a professional is looking after your house. While a friend might not realise how important it is to bring the bins in, or might forget to switch a light off, someone who house sits day in, day out is unlikely to make these mistakes. On the other hand, some people may feel uncomfortable letting a stranger take care of their house, particularly if they are leaving valuables or other sensitive materials behind while they’re away. To make sure you don’t overlook any important details when searching for a house sitter, check out our house sitting checklist. Welcome home preparation services: Rather than arriving home jet lagged and having to clean the house and restock the fridge, some companies now offer ‘Welcome Home’ services. Usually, before you arrive home, they will arrange to have your house professionally cleaned and your fridge stocked (simply provide a grocery list of your favourite foods). If you’re feeling particularly indulgent, some places even provide ‘Fresh Flower Services’, so you’ll be greeted with great-smelling flowers when you walk through the front door. Exterior home checks: If giving a stranger access to the inside of your home makes you feel uncomfortable, many companies now offer exterior only services. Typically, they will do a complete check of the exterior of your property at your chosen interval (i.e. daily, weekly etc.) and let you know if anything appears to be amiss. 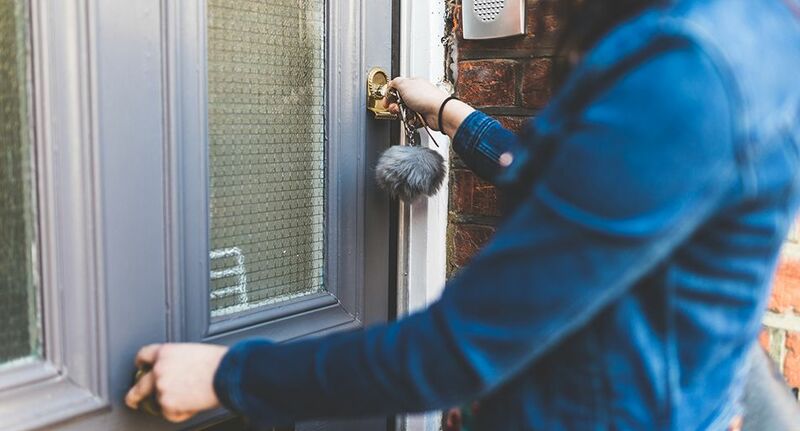 This way, you can have the peace of mind of knowing your home’s safe, without having to worry that a stranger is looking after the inside of your house. Depending on the company, some exterior checks may also include bin services, collecting the mail, and starting any vehicles if required. General maintenance services: Maintenance services will usually include things like emergency repairs, mowing the lawn, responding to alarms, switching the lights on and off as necessary, and any other household chores required to keep your home in optimal condition while you’re away. Watering services: Watering services are another great option if you’re not looking for a full time house sitter. Many companies will send someone over to water your indoor & outdoor plants, or just your outdoor plants if you prefer, as well as your garden beds and lawns. If your garden is your pride and joy, this will ensure your plants are well looked after while you’re away. If you’re only going to be away for a few days, several automated hoses and sprinkler systems can also be programmed to perform this task. Pet sitting: Rather than sending your pets to the kennel, pet sitting services allow them to remain at home in comfortable, familiar surroundings. Typically, this will include providing your pets with food and water, play time and walking, administering any medications, cleaning litter boxes/cages, and maintaining any other equipment, although you should check in advance with your chosen provider to see if certain things cost extra. Some places can also install cameras, allowing you to keep a close eye on your furry friend while you’re away from home. There are even a few companies who install two-way audio, so you can continue that thrilling conversation with man’s best friend from afar! Meeting service providers: If during the mad rush of organising your holiday you forgetfully booked the plumber to come the day after you depart, many companies can now organise for someone to meet any handyman, repairman, installation person, or other service provider that you authorise, and stay with them until the job is completed. If you’re interested in using any of these services during your next holiday, a quick Google search should show you what services are available in your area, and help you to select the right one for your property. Ultimately, it’s important to weigh up what you value most when it comes to your home’s security. A variety of factors, such as where you live, whether or not you have pets, your budget, and your home’s contents will influence this decision. Accordingly, friends, neighbours, house sitters, and house sitting alternatives can all be good options. No matter who you go with, the important thing is to make the best choice for yourself and your house, so you can have confidence that your home will be safe while you’re off globetrotting! For additional tips to bolster your home’s security even when you’re not on holiday, check out our home safety checklist.